Home » Greenroom » The Secret of Why Chefs Wear White Revealed! When you think of certain professions a particular type of clothing comes to mind. For example, when you think of police officers – the image that appears in your head is a person wearing a police uniform, right? The same goes for soldiers, doctors and chefs as well. Usually, when you think of chefs, you picture white jackets and white, tall hats. 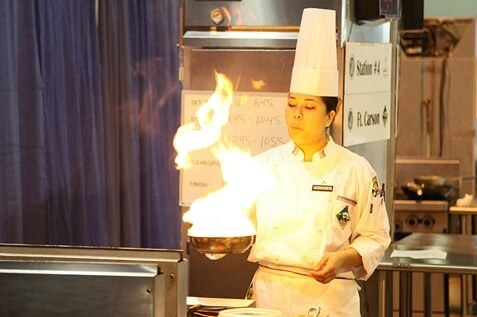 Although white is the most common colour of chefs’ uniforms, they are also available in different colours and styles. Alsco has different varieties of food and beverage garments. White or coloured, patterned or plain, with or without your company’s logo, it’s up to you. You can choose your workwear according to your specific needs and preferences. Working in a kitchen is often dirty work, especially in a professional environment. So, have you ever wondered why chefs most often wear white uniforms? The traditional white chef’s uniform is a product of the 19th century. The first chef’s jacket was white, wide-flapped and double layered. The original idea of the last detail was that a chef could reverse their jacket when it became soiled. By reversing it, the chef could use it for twice as long. It is clear that wearing white in the kitchen can be very tricky and challenging. When working with food, there is always at least some spitting, pouring, spraying and it’s difficult to finish the shift without stains on your uniform. Although stains are the most visible when wearing white, white material also can be bleached. That is something that cannot be done with jackets of any other colours because the bleach would ruin the colour. In addition, white is the colour which does not absorb heat, so it offers adequate protection for chefs from the intense heat of cooking. Another reason for chefs’ uniforms being white is that it shows a chef’s commitment to cleanliness. Preparing food for other people is a very delicate job. You have to find ways to reassure your customers that the food you are cooking for them is prepared in the cleanest and safest way possible. Therefore, wearing a white jacket in the kitchen makes much more sense, wouldn’t you agree? 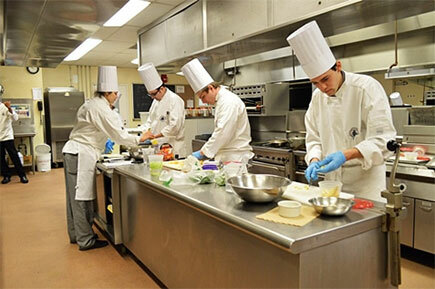 The white hat, known as the Toque Blanche, is a piece of clothing that makes a chef recognisable. These hats have a fascinating history as it’s said that they were adopted from the headgear of the priests of the Orthodox Church. In the beginning, the hats were grey and but were later changed to white by Marie-Antoine Carême, together with the rest of the chef’s uniform. It was Carême’s idea to change the height of the hats. The most experienced chef wears the taller hat, while apprentice chefs wear hats that look more like caps. The traditional chefs pants were those with black and white checkered patterns. This design helps hide food stains. However, you will see many different patterns and colours on the chefs’ nowadays. Chefs use aprons that are folded and tied at the front. They serve as additional protection and can be the perfect piece of clothing to put on your company’s logo on. All of these items of clothing help chefs to perform their duties in the kitchen in the most functional and efficient way. So, everything you see on a chef has its purpose! 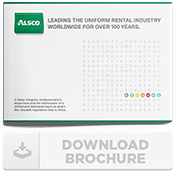 Alsco offers a variety of comfortable and hygienic food and beverage workwear that can help keep your staff look clean, smart, and professional.